An image really has impact when in 6 years 74 requests from 20 countries are received to reproduce it! The requests to use the Canberra Transport Photo with permission – given freely by We Ride Australia of course! – have come from municipal councils and governments, advocacy organisations, research institutions and publishers to name just a few. It has also been re-posted, tweeted, pasted into presentations many, many more times than even we will ever know. The photo use leader board is led by the USA with 13 uses. A close grouping of three countries follow; UK with 12, Germany with 11 and Brazil with 9. Some of the more interesting requests have come from India (1), Lithuania (1) and South Africa (2) going to show how universal advocacy for active travel is. The photo was organised on a frosty Sunday morning in Canberra Australia in late 2012 and we had a fabulous roll up of Canberra volunteers that included interested locals, members of Pedal Power, parents and family members and at least two Members of Canberra’s Legislative Assembly and one federal Member of Parliament. 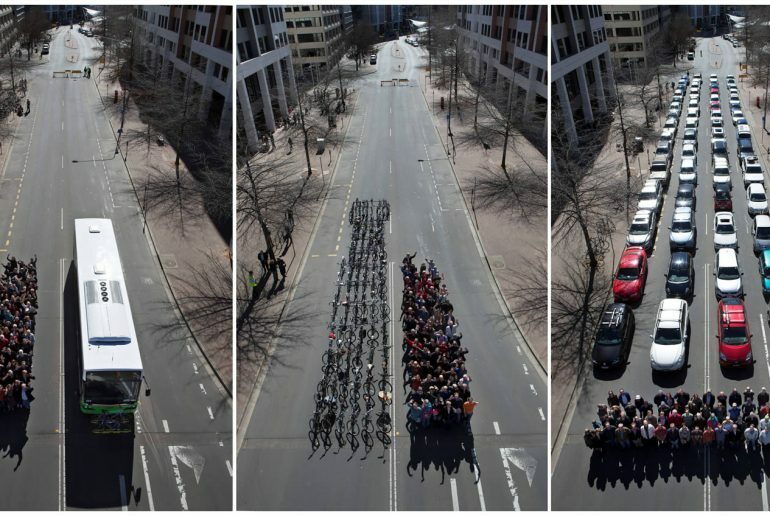 The ACT Government helped with traffic planning and ACT buses provided one of their own – which incidentally provided the number of people we needed as the capacity of the bus was 69 people! Purely by chance, at an average motor vehicle occupancy rate of 1.1 persons per car trip in Australia at the time, it gave us a nice round 60 cars needed to carry our 69 people!! A perfect four rows X 15 cars. The smallest car was Greens MLA Caroline Le Couteur’s Smart and we did have a tandem. 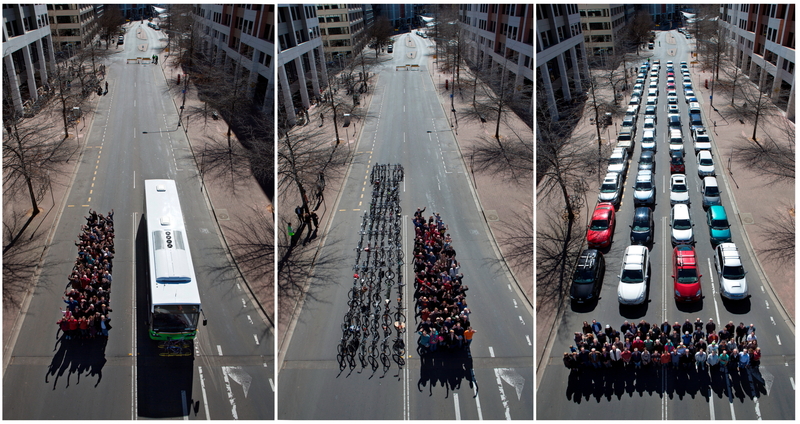 While We Ride Australia focuses on national advocacy for active travel, initiatives and policies for bicycling and cycling advocacy, our investment and effort to create the Canberra Transport Photo has gone truly global! We’re very grateful to the people of #Canberra and the ACT Government, @TCCS_ACT, for helping us create it, the photo is still telling the story! Country list: Australia 5, Austria 1, Belgium 1, Brazil 9, Canada 5, Croatia 1, Czech Republic 1, Finland 1, France 3, Germany 11, India 1, Lithuania 1, New Zealand 2, Poland 1, South Africa/Africa 2, Spain 2, Swede 1, Switzerland 1, United Kingdom 12, United States of America 13. No bikes (or cars) were hurt in the making of this photo! If you would like to use the photo for your publication, thesis, advocacy campaign or website no problem! Just drop us a line and we’ll provide you with a high resolution version if you need it! Contact us here.